Seriously Joking: Celebrating Ramadan Eid - the "sheerkhurma"
The last few days were memorable. This is my second Ramadan Eid in the Kingdom. While I have stayed in touch with my family and my friends from India through various modes of communication like the phone, email, Whatsapp, Wechat, Skype, etc. I tried (and am trying) to reach out personally to everyone I know in my town to wish them personally, whether they are "ajnabees" (expats) like me, or Saudi acquaintances. 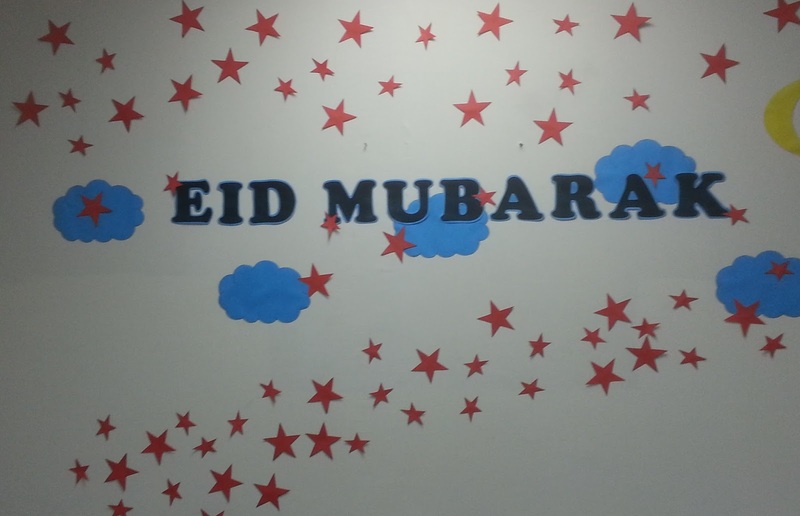 A few days before the actual day of Eid, the hospital takes on different hues as the nursing staff go about decorating the various work areas with floral designs, stars and the moon, and hanging as well as wall-mounted festoons. Their effort is really noteworthy, as they (especially the Filipino nurses) are extremely talented in the arts and the crafts. 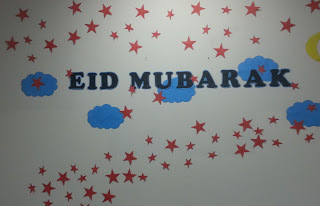 They work ceaselessly till the various areas of work are adorned with beautiful decorations. The photos alongside are just a few of the decorations they put up.In addition, they also put up streamers and balloons. It looked like a party! It reminded me of the decorations that Christian nurses put up during Christmas, or Hindu nurses put up in Diwali in India. However, in Saudi Arabia, there is no music, singing or dance. Hence, the celebrations just don't measure up to the image I have in my mind or the idea of celebration. Even so, it was nice interacting with the staff in the hospital. 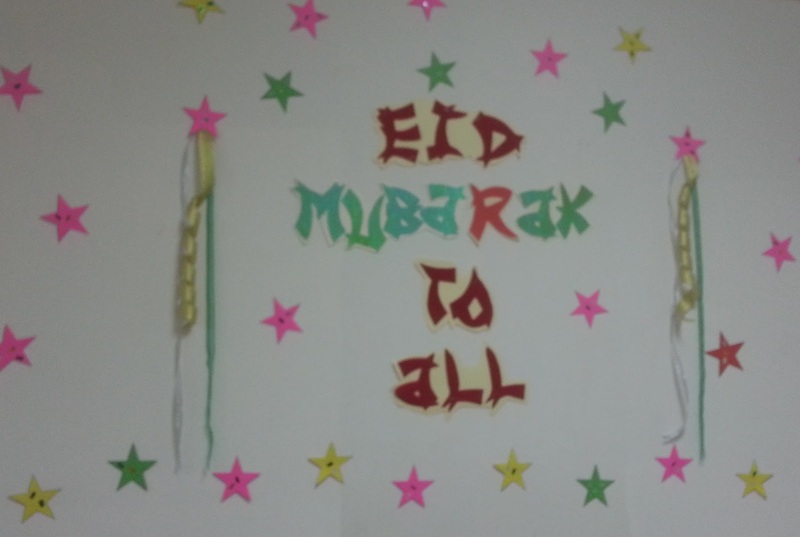 Of course, during Eid, we continue to work, as there would be compensatory offs later on. However, there are hardly any patients during the last few days of Ramadan and the first few days of Shawaal (the ensuing month, the first date of which is the Ramadan Eid). To celebrate Eid, the hospital distributed a few chocolates to each staff member. On the day after the Eid, I took out the time to prepare "sheerkhurma" the special drink for myself as well as for my friends and acquaintances in the hospital. To this end, I had begun preparations about four or five days ago. Purchasing 3 litres of milk and a small box of saffron, plus the needed quantity of all the dry fruit that is needed for making this drink, I was busy dicing the dry fruit a few days before the actual preparation. The actual preparation takes about three hours, as the milk has to be boiled first. 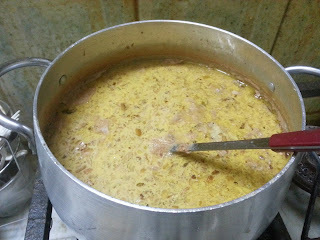 The sheerkhurma is ready ... yum. 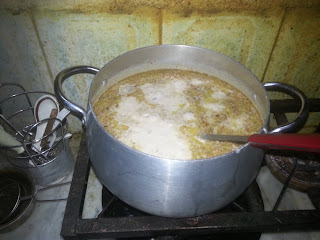 After this, one takes a big cooking vessel, adds ghee to it, and once that is hot, one fries all the chopped dry fruit in it; then, one adds sugar, chopped dried dates, and milk to this mix. Also, one adds vermicelli. I used roasted vermicelli for the same. 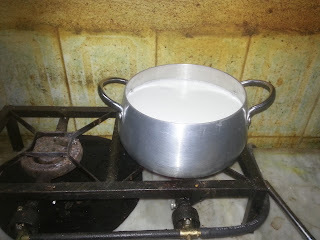 After this, one boils and boils the milk till it is reduced by about 25-30%. During this process, one can add yellow raisins - which will bloat up as the milk heats them. The last step is to add saffron leaves, which imparts the unique flavour to the drink. The sheerkhurma must be drunk hot ... as hot as the tongue can tolerate it. In some ways, this drink resembles the south Indian payasam.However, there are different kinds of payasam, but only one kind of sheerkhurma. My sheerkhurma was near perfect; the only ingredient lacking in this is called the "charoli", a humble dal-sized dry fruit that adds texture and taste to sheerkhurma. When I took the drink-filled vessel to the hospital on the afternoon of the Eid, there was a lot of curiosity. Most people who partook of the half glass of the drink that I served to them were amazed at the taste and loved it. It was very gratifying when the hospital director also praised the drink; one of the nurses went so far as to doubt that I had made the drink! The entire drink was consumed within an hour. I regret only that I was unable to share the drink with the remaining hospital staff who would come to work in the afternoon and night shifts. The Eid duty meant that we had to work even on an otherwise off day, viz. Friday. The loss of an off day was extremely disappointing, but I made up for it on Saturday, which was an off day. Eventually, work resumed on Sunday, and, as I write this, it has been an eventful week. 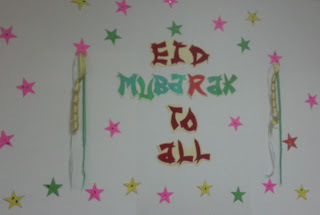 Thank you for reading this ... and have a wonderful Eid, dear readers.